Residents and business owners across the North Yorkshire town of Selby will now have access to super fast broadband after a new mast was installed on top of Selby Abbey. The new addition to the Grade I listed building is expected to provide locals, who have long struggled with poor connectivity, with internet speeds of up to 50 megabits per second. The new installation will also benefit visitors, providing WiFi access inside the local landmark. 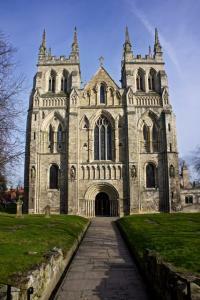 According to Reverend Canon John Weetman, Vicar of Selby Abbey, the building was the first monastery to be founded in the North of England following the Norman conquest, and is one of only a handful that is still in use as a parish church. The Reverend added that the abbey, which was granted its founding charter by William the Conqueror, has always played an important role in the local community, due in part to its openness to new ideas. He continued: "Now in our 950th year, this partnership with Quickline is another example of how we embrace new ways of working. It will benefit everyone in and around Selby and we are delighted to be part of the new digital age." The mast was installed on top of the abbey by internet provider Quickline, who specialise in providing super fast, wireless broadband to rural locations. According to Hayley Silvester, head of sales for Quickline, the company is able to provide super fast broadband to any area as long as there is a line of sight, filling a gap in the market left by many larger telecoms providers. "It will make a huge difference," Ms Silvester added. "Our partnership with the diocese also means churchgoers will have WiFi connectivity before and after services and during parish social activities." The wireless internet provider has revealed that it is also hoping to help other local areas struggling with connectivity, and not covered by the North Yorkshire Better Broadband phase 3 rollout plan, to overcome any technological barriers that could stand in the way of access to super fast broadband.